For more than a decade, the Census Bureau has been developing an alternative measure of poverty that is intended to better reflect the costs of basic living expenses as well as the resources people have to pay them. The bureau has just released results for 2010 from the alternative metric—called the Supplemental Poverty Measure (SPM)—that uses a wider range of factors than the official federal measure to determine poverty status. The additional data used in the alternative measure include medical expenses, tax credits, non-cash government benefits (such as food stamps, housing subsidies and school lunch programs) and cost-of-living adjustments for different geographic areas. The alternative measure is not intended to replace the official poverty measure, at least for now. For the foreseeable future, the Census Bureau will report two sets of numbers. Compared with the official measure, SPM figures released by the Census Bureau show a higher national poverty rate for 2010, 16.0%, compared with the official poverty rate of 15.2% (Short, 2011).1 The number of poor people in 2010 was 49.1 million using the alternative measure, compared with 46.6 million using the official measure. Using the SPM also resulted in higher poverty rates for some groups and lower poverty rates for others, when compared with the official measure. Among the nation’s largest racial and ethnic groups, poverty rates using the alternative measure are higher than official poverty rates for Hispanics, whites2 and Asians, but are lower for blacks. For Hispanics, the SPM poverty rate (28.2%) was 1.5 percentage points higher than the official poverty rate of 26.7%. 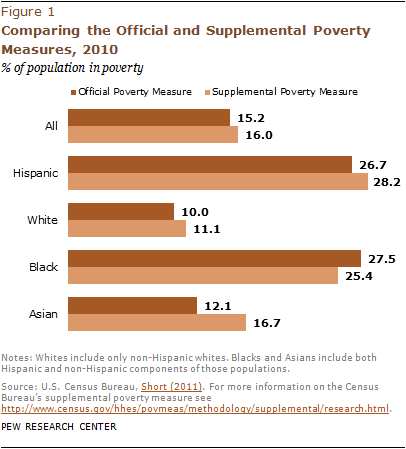 For whites, the SPM poverty rate was 11.1% while the official poverty rate was 10.0%. For Asians, the SPM poverty rate was 16.7% versus the official poverty rate of 12.1%. By contrast, the SPM poverty rate for blacks, 25.4% in 2010, was 2.1 percentage points lower than the official poverty rate of 27.5%. When the alternative measure is used, a greater share of Hispanics in 2010 lived in poverty than any other group. By contrast, when using the official poverty rate, a greater share of blacks in 2010 lived in poverty than Hispanics or any other group. Even so, no matter which measure is used, Hispanics make up nearly three-in-ten of the nation’s poor—28.6% under the official poverty measure and 28.7% under the SPM. The nation’s youngest and oldest age groups also show notable differences in their poverty rates depending on whether the official measure or the SPM is used. For children younger than 18 in 2010, the SPM poverty rate was lower than the official poverty rate—18.2% versus 22.5%.4 For the elderly, by contrast, the SPM poverty rate was higher than the official poverty rate—15.9% versus 9.0%. One explanation of the difference for children is that the SPM, but not the official measure, accounts for the in-kind benefits of government programs that target families with children, according to the Census Bureau. One explanation of the higher poverty rates for the elderly shown in the SPM, according to the bureau’s analysis, is that the alternative measure incorporates out-of-pocket spending on health care costs. The share of people born in the U.S. who are poor did not change significantly using the SPM in 2010, compared with the official measure, but the poverty rate for immigrants was higher—25.5% versus 20.0%. For immigrants who are not U.S. citizens, the SPM poverty rate was 32.4% in 2010, while the official poverty rate was 26.7%. For naturalized citizens, the SPM poverty rate was 16.8% in 2010, compared with the official poverty rate of 11.4%. Because the SPM accounts for cost-of-living differences across geographic areas, it produced different results from the official rates for cities, suburbs and non-metropolitan areas. The SPM poverty rate for residents outside of metropolitan areas was lower than the official poverty rate—12.8% versus 16.6%. By contrast, among those who live in metropolitan areas (cities and suburbs), the SPM poverty rate was higher than the official poverty rate—16.6% versus 15.0%. The SPM, which was developed by the Census Bureau and Bureau of Labor Statistics5, will not replace the official measure of poverty that has been used since the 1960s. The federal government’s official poverty measure defines thresholds based on the cost of a basket of food, adjusted for householder age, family size and composition. These costs are compared with before-tax cash income (including Social Security payments and cash welfare grants) to determine poverty status. The alternative poverty measure, by contrast, starts with the cost of a basket of food, clothing, shelter and utilities, and adjusts it based on a wider range of family types and housing costs in different areas. The SPM also accounts for a larger range of financial resources, adding the value of non-cash benefits such as food stamps and subsidies for school lunches, housing costs and energy bills, while subtracting expenses such as taxes, child care costs and out-of-pocket spending for medical bills.